Sapa is the premier hill station in northern and an incredible place for trekking lovers. 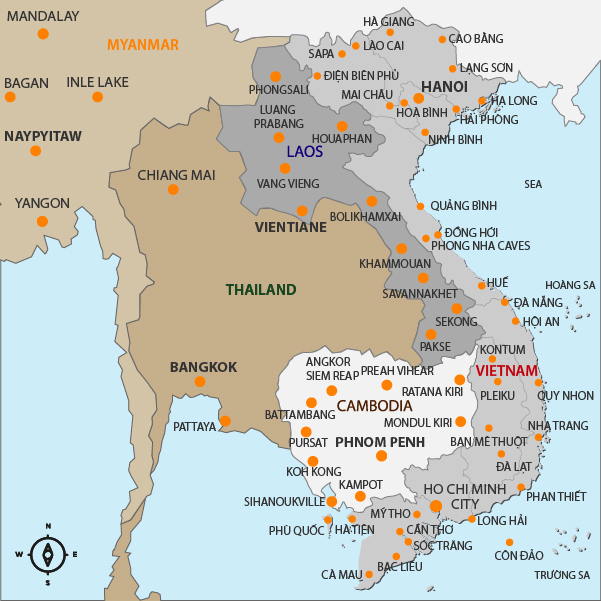 This has been a crossroads for millennia for Vietnamese, Chinese, and a diverse array of minority groups, all of whom have left the stamp of their cultures. Many minority groups retain their traditional ways of life in earthen or wooden houses in the valleys from which they tend animals and farm the hillsides above. The scenery of the imposing mountains and rice terraces gives this area a great combination of nature and culture and is definitely a place for adventurers. Join us on this trip to experience a great trekking tour through village settings. And learn about the fascinating cultures of the locals. 20:30 - Depart at our Office to Hanoi Railway Station to catch the night train to Lao Cai (Sleeper cabin with air-conditioning). Around 6:30 - Arrive in Lao Cai and be transferred by shuttle bus to Sapa. The bus ride uphill to Sapa takes a little over an hour giving you a glimpse of the stunning vistas and impressive rice terraces. On arrival, you will stop by our office, meet your tour guide and leave your luggage and take a shower in our partner's hotel if you would like. After a full buffet breakfast, our local guide will meet you at 9:00 and we’re then ready for a full day trek on the foothill of Mount Fan Si Pan to the Golden Stream valley. The first part goes downhill for about an hour and a half toward Y Linh Ho hamlet. After crossing a suspension bridge, you will see some stunning views of the rice terraces, gardens, and houses. The trail leads up to Lao Chai San village where we have a simple lunch. 13:00 - After lunch, we walk down through the villages Lao Chai (Black H’mong) and Ta Van (Dzay). This is the biggest and the most scenic valley in Sapa. This trek is relatively easy and offers opportunities to visit local families and learn about their daily life and fascinating culture before arriving at the homestay in Ta Van. We have dinner here and stay overnight. With ‘Homestay’ experience, your overnight accommodation is provided by a local family in their traditional house-on-silts. There’s no private room and you’ll sleep on the floor in a large communal area. The sleeping corner is set up with a single mattress (thin, but adequate), blankets (ditto), pillow and mosquito net. The restroom is at international standard and a few steps from the main house. After breakfast, we explore the village a little bit further. We then start a 3-hour trek to Giang Ta Chai village (Red Dzao). This trek offers some moderate challenges as we negotiate a winding trail by rice terraces along the steep mountainside. The vegetation is dense as the trail leads up to a peaceful hamlet perched on the side of Hoang Lien Mountain. After visiting a family in the village, we walk to get back on the main road. We then head back to Ta Van, where our vehicle awaits to take us back to Sapa town. 13:00 - We drive back to Sapa for a late lunch in a local restaurant, and you’re free to explore the town, its market and sloping streets with many colorful handicrafts. 15:30 - Meet the guide at our office. A car takes you to the bus station. Around 21:00 - Arrival in Hanoi center (Ly Thai To street). The transfer from there to your hotel is not included. With your free time, you can go up to Ham Rong peak where you will be able to experience a great view over the town of Sapa. This is a great chance for some unforgettable photos! This is only recommended for a good weather afternoon (Entrance fee is not included). Please contact our travel consultants at sale1@rosetravelservice.com to get discount for group of more than 2 people and/or request for a private tour for solo traveller. The price is exclusive of Surcharge in peak season (Christmas & New Year). Accomodation: One night on train, One night in Ta Van. Beverages, gratuities and personal expenses. For the ones who want to explore Halong further and with a pronounced taste for active travel. Let’s discover some of the quietest parts of the archipelago with a harmonious combination of comfortable cruising and fun activities.